This tutorial talks about how to highlight multiple keywords on webpages in Firefox. To do this, there is a Firefox addon called Multi-Keywords Highlighter. This Firefox addon takes a list of coma separated list keywords you want to highlight. It highlights the keywords you have specified with different colors on every page you visit. Also, it shows the number of total highlights on a page right from its icon. You can change the keywords list anytime and it shows the corresponding highlights in real-time. Multi-Keywords Highlighter is very useful addon if you want to quickly spot a group of words. You just have to get ready with a list of keywords and browse the websites. The addon will automatically highlight the matching keyword with distinct colors. However, in this addon, you cannot see the highlight count of keywords separately. 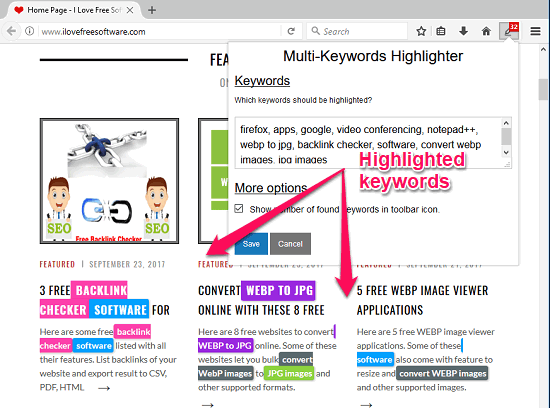 How to Automatically Highlight Multiple Keywords on Webpages in Firefox? If you have ever used some text highlighter addons, then you will find it to be very easy to use this addon. You can access it from the Firefox toolbar whenever you need it. And I have already told you that it works with a comma separated list of keywords that you specify. You can spot the keywords that it highlights pretty easily it makes them look different on webpages. 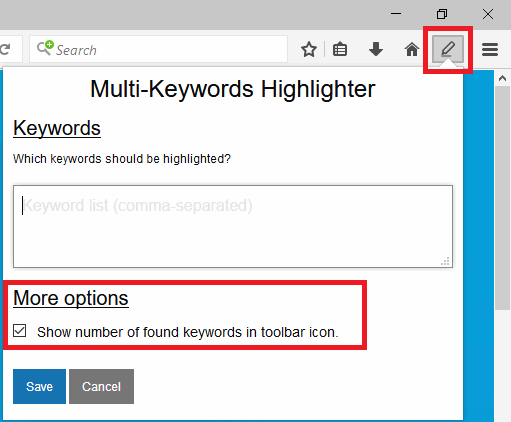 To see how Multi-Keywords Highlighter works, simply go through these simple steps. Step 1: After you have installed Multi-Keywords Highlighter addon, click on its icon from Firefox toolbar. The interface of the addon will appear. On its interface, there is a text box to define keywords to highlight and you can also opt to see the count of highlighted keywords on its icon. Step 2: Now, define the keywords in the box that you want to highlight on webpages. After that save the changes. Also, if you want to see the count of keywords that it highlights, then check the count option. Step 3: Start browsing the websites in the usual manner and the keywords you have specified will be highlighted. You can also see the count of the highlighted keywords on the icon of this extension. 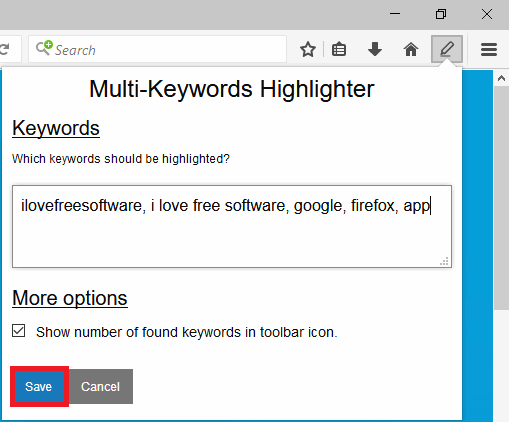 In this way, you can automatically highlight multiple keywords on webpages in Firefox. And Multi-Keywords Highlighter is all you need to do that in a very simple way. The addon does what it says and you can automatically highlight keywords on different web pages. 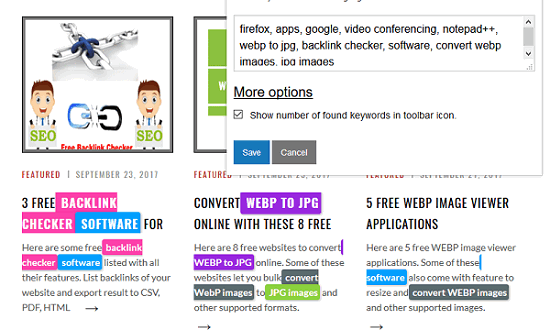 Multi-Keywords Highlighter is a very nice Firefox addon to automatically highlight multiple keywords on webpages in Firefox. This unique tool is helpful if you are from SEO field. Using this addon, you can analyze the occurrence of certain keywords in a whole new way. A tech freak who is crazy about Windows. Knows from Registry to MS Paint, and can write about them all. How to Get iPhone X Gestures on Android?